This wall art from PolyStudio.shop takes ring bowls to a different level. This could simply be a pile of polymer bowls that have been made more exciting with Swellegant! dyes and metal coatings. 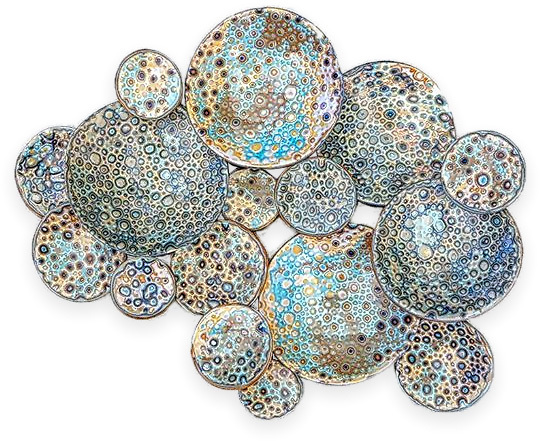 But wouldn’t this assemblage of bowls look great on the wall? I’m calling it wall art. Sometimes I have to improvise. It’s not often that I can’t dig around a site to identify the artist of a piece but PolyShop.shop has me stumped. Will one of our French friends help? I prowled through the shop, Instagram, and Facebook to no avail. PCD will call this our Monday Mystery and wait for your clues. Thanks for the assistance! It is wall art and it’s from Valerie (Veesuel on FB). Dear Cynthia, it looks like the work of Veesuel Polymere (visible on FaceBook). Sonya is right 😉 I did it for some times ago. And you’re right, Cynthia, it’s a wall art to hang on a wal ! Oh, yes! Wall art. Love it and the bowls.